Wood has always been co-related with producing some of the most genuine sounds of all other materials, thus most of the classical instruments are traditionally made of wood, but during the past few years we have become quite insensitive to mother mature and gone and destroyed all her green forests leaving us with only a few thousand acres to spare. 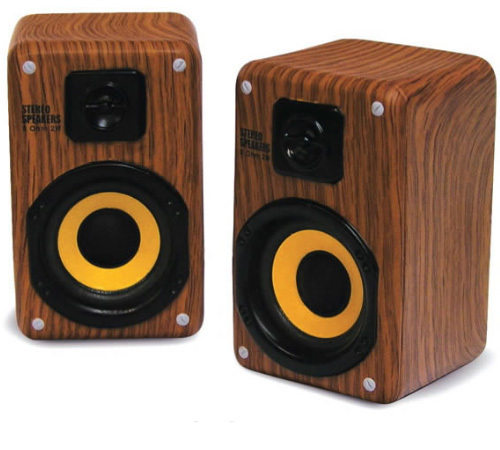 These Wood Grain Speakers are made from stylish faux wood and thus do not pose any great threat to the environment. These stylish speakers are neither too big that they do not fit on to your geeky desk and nor too small so as to not produce enough sound, they are of just the perfect size that makes them easy to carry and transport. Powered by USB, they are quite compatible with the other standard audio jacks like the audio plug of diameter 0.35cm. Each individual speaker stands approx 2.5″L x 2.5W x 4.5″H, making them highly compact, and since they offer a frequency range of 200-5000Hz they are pretty powerful for their small size. Selling for just $29.99 these speakers are perfect for and desk that lacks a good musical environment. You can also check out the cool iPhone rotating speakers or the stylish Shaira DAB Radio Design.